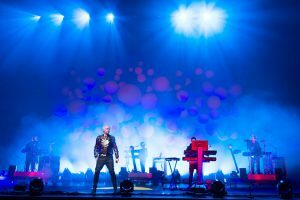 Despite not having toured since 2002, electro-pop duo the Pet Shop Boys played to an exuberant crowd at San Francisco’s Bill Graham Civic Auditorium in early November. Mix stopped by the Fundamental tour, where we asked front-of-house engineer Colin Boland and monitor engineer Seamus Fenton about the LD Systems-provided system. Lowe plays a Korg Triton, which runs a Mac-based patch change system with two Virus Access rackmount modules. All the keyboard patches are submixed through a Yamaha 01V.